While drug addicts, communists and the opposition Liberal Party have bore the brunt of President Rodrigo Duterte’s furor, there is another group that has been on the receiving end of his ire — the Roman Catholic Church. Even before winning his office in the 2016 general election, the former Davao City mayor had already fired a salvo at the religious institution – which also happens to be the dominant religion in the Philippines – when he cursed Pope Francis for causing gridlock traffic during his visit in 2015. In the years since then, Duterte has continuously expressed vitriol for the Church – from mocking the tenets of the religion, to outright calling for violent attacks against its emissaries. The President’s obsession with the Roman Catholic Church and its hierarchy can be explained by observing his other breakthroughs during his reign thus far. When Duterte’s allies successfully evicted Supreme Court Justice Maria Lourdes Sereno in May 2018, it essentially gave the Administration control over the executive, legislative and judicial branches. Sereno was an appointee of the previous Aquino Government, whose Liberal Party is now the main opposition party to incumbent government. The incumbent administration holds a super-majority in Congress, and with Sereno gone could then appoint a new Chief Justice aligned to their agenda. With all three branches of Government loyal to him, this should pave the way to Duterte’s unbridled reign right? In the ultra-religious Philippines, there is another power-broker that has – for a long time – wielded influence in the country’s political sphere. The first estate, or the Church and its clergymen, is a dominant force in shaping public opinion and are continuously courted by aspiring politicians for their endorsement. The Roman Catholic Church is the biggest reason why the passage of the Reproductive Health Bill – a comprehensive reproductive health policy – took so long, and until now is still tied-up in a Supreme Court battle. The fact that the Philippines remains only one of two sovereign nations (the other being Vatican City) where divorce is not legal is a testament to the Philippine clergymen’s powers. A 2015 report by Pew Research Center showed that an estimated 81% of Filipinos were Catholics, and a more recent 2017 news article by ABS-CBN news affirmed that percentage also. The Church’s influence over Filipinos is so far-reaching that Duterte admitted it himself, in a July 2018 speech he slammed “the creeping influence of the Catholic faith” and lamented how that reality affects his ability to implement his agenda. Therein lies the explanation for the President’s compulsive targeting of the Church – with the Opposition crippled in the legislature, and his own minions taking charge of the judiciary, the only force that stands in the way of Duterte’s path to limitless control is the equally-powerful Catholic Church. This is especially true given that their hierarchy are consistently criticizing the President’s agenda, particularly the infamous war on drugs. 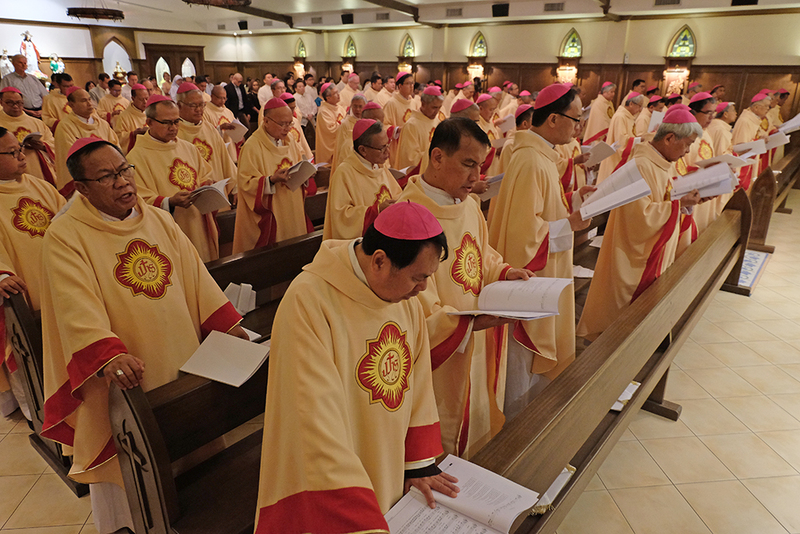 The Catholic Bishops’ Conference of the Philippines (CBCP) have been the most vocal opponents of the brutal crackdown on drug users, and this has earned them the ire of President Duterte. Hence, the President has relentless sought to destabilize the structure of the Church. 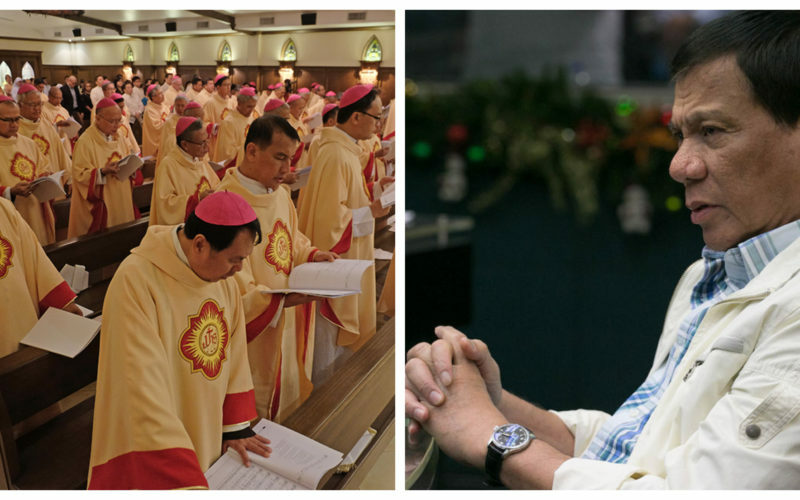 He has continuously targeted the credibility of priests by publicly condemning their alleged hypocrisies, and making hyperbolic statements saying that “almost 90% of priests” are homosexuals which were intended to put-off a Filipino public who still hold less-than-liberal views on unconventional sexual orientations. In November 2018, Duterte made a plea to Catholics to “stop going to Church” and instead “make their own chapels at home”. Just four months earlier, he gave a speech stating that Catholics should quit their faith and instead follow the “Iglesia ni Duterte” (Church of Duterte). Most people dismissed these pronouncements as merely the common off-the-cuff remarks the President is prone to give, but it can be argued instead that those statements hold notable significance. 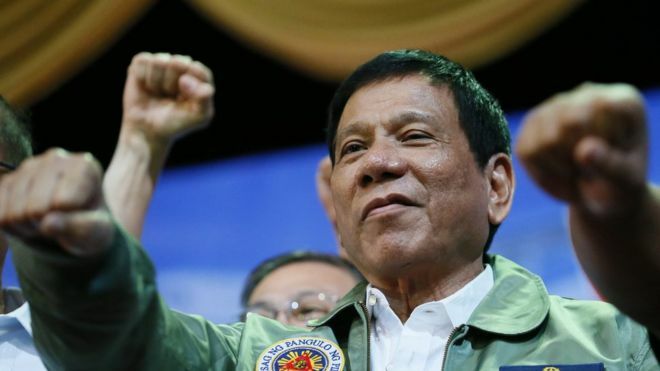 Duterte is trying to sway Filipino Catholics to abandon the Church and instead turn their allegiance onto him, thereby anointing him with the uninterrupted power he desires. For any other political personality, waging a war with the Catholic Church would be career suicide. However, Duterte finds solace in the fact that he continues to enjoy solid support from Filipino voters – which means he can clash head-on with an also popular Church. In a battle between two behemoths, who will falter first? Whether that will be the popularity of Duterte or the strength Catholic Church is yet to be seen. But rather than seeing their perpetual friction as mere accidents, we need to realize that it is essentially a battle for control of the Philippines.